Paul and Rachel Chandler are pictured in an undated photo before their capture last year by Somali pirates. (CNN) -- A British couple kidnapped by Somali pirates in the Indian Ocean last year said in a videotaped message they "desperately need" new British Prime Minister David Cameron to clarify whether he will work to secure their release. 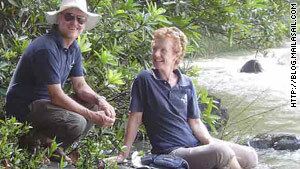 Paul and Rachel Chandler, from Kent in southern England, were taken from their yacht near the Seychelles Islands in the Indian Ocean in October. A local journalist interviewed the couple in a rural location in Somalia last week, according to CNN affiliate ITN. The journalist paid no money to the pirates, who stood behind the camera during the interview, ITN reported. "As you can see, we've lost a lot of weight and a lot of fitness, but otherwise we're not physically ill," Paul Chandler said. "We're coping and we're resigned to our situation, and we're trying to make the best of it and keep ourselves well," Rachel Chandler said. The couple said they were separated from each other earlier this year but reunited seven weeks ago. They are able to listen to a radio, they said, so they know about the recent British election that brought Cameron into office. "We desperately need him to make a definitive public statement of the governments attitude to us," Paul Chandler said. "We're two British citizens, we've been kidnapped in the Seychelles -- it was a perfectly safe place to be. If the government is not prepared to help, then they must say so because the gangsters' expectations and hopes have been raised." The British Foreign Office released a statement late Wednesday saying consular officials are in close touch with the Chandlers and urging the kidnappers to let them go. "Paul and Rachel Chandler are innocent tourists," the statement said. "The U.K. government's policy of not making or facilitating substantive concessions to hostage-takers, including the payment of ransoms, is long-standing and clear. This has been the policy of successive governments and has not changed." The captors initially demanded a ransom of $7 million, but the British government refused to pay. Paul Chandler said it is not correct to call their kidnappers pirates. "This is absolutely not piracy. It mustn't be reported as such. It's kidnapping and extortion and even torture," he said. He didn't elaborate on the torture claim other than to say the separation from his wife of 30 years had been "real torture." Said Rachel Chandler, "Simply not knowing what was happening and whether we would be together again, when, where each other was, was real torture -- mental torture." She said the kidnappers regard the pair as "just animals." "We've been kept caged up like animals," she said. "They don't care about our feelings and our family and our lives, and what they've taken. They don't care whose lives they ruin. They just want the money." British Royal Navy ships and other military vessels patrolling the dangerous waters off East Africa have become a "laughing stock" because they "can't do anything" to stop the piracy, Paul Chandler said. His wife said they take strength thinking about their family back home. "We are being strong for them because they keep us going, knowing that they are there supporting us," Rachel Chandler said. "We know that they are doing their best. It's been seven months and we know that they must have been suffering alongside us, and we care about them very much."